A pioneer in the field of online driver safety education, DigitalDefensiveDriving.com® offers New York state-approved defensive driving courses that drivers can take to reduce insurance rates, and improve driver safety. We offer more ways to take defensive driving than any other course provider; with our in class course and Internet course we make it easy for you to take the course. Companies utilizing the course to meet training, safety, or risk management objectives appreciate the flexibility of the DigitalDefensiveDriving.com courses, which allow employees to complete the course at their own pace over a 30-day period. Contact Us today for more information on how we can train your employees and/or corporate fleet. DigitalDefensiveDriving.com's courses are based on convenience. All of our defensive driving courses are available 24/7. We put each student in the driver's seat - you can develop your own course schedule, taking the course in as few as six hours all at once or at your convenience over a 30-day period. Over the last 14 years, DigitalDefensiveDriving.com has offered an approach to defensive driving New York residents have utilized when they want the benefits of a driver safety course but have limited time in their schedule. One particular part of the New York population for which DigitalDefensiveDriving.com has been of great value is the students. DigitalDefensiveDriving.com saves lives by educating our students on the importance of preventing injuries and deaths at work, in homes and communities, and on the roads through leadership, research, education and advocacy. 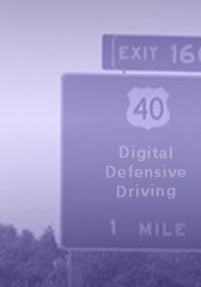 The defensive driving courses from DigitalDefensiveDriving.com are trusted by more traffic safety courts, motor vehicle departments, municipalities, businesses, government agencies and driving schools nationwide for consistent quality and content. DigitalDefensiveDriving.com sets the standard in the industry for development and training of quality classroom instructors. Your instructors will keep the course interesting. The DigitalDefensiveDriving.com online course is engaging and effective. The DigitalDefensiveDriving.com classroom course is highly effective interactive course and features activities, case studies, discussions and video presentations. For more information call: 845-590-2974 or contact us.